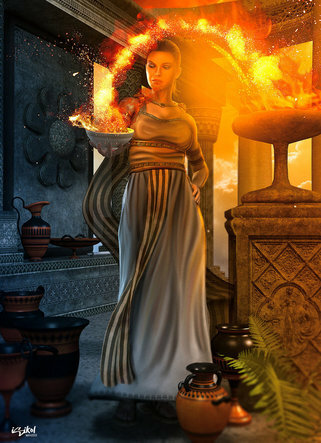 Hestia is the Goddess of hearth fire and the residing spirit of the home. Although typically described as a Goddess of the hearth, Hestia is technically the Goddess of the fire in the hearth: contained, controlled, ritual fire. She also presided over the cooking of bread and the preparation of the family meal. Hestia was worshiped in the home and every city and town had an official sacred hearth where She was tended and venerated. Hestia is always the first of the Oympian Deities invoked. The first part of every sacrifice was offered to Her. She bears a reputation as the kindest of all Olympian spirits. She protects the inhabitants of homes, enforces hospitality, and may be invoked for fire safety. She is a benevolent Deity, quiet, humble and modest, but exceptionally powerful. Hestia is an archetype of inner centeredness. There are not too many myths about Hestia. Both Apollo and Poseidon sought to marry or at least romance Her, but She turned both down, vowing to remain solitary and autonomous. Hestia is so powerful that both these notorious Goddess ravishers graciously took “no” for an answer. In myth Hestia was the first born child of Kronos and Rhea who was swallowed by her father at birth. Zeus later forced the old Titan to disgorge Hestia and her siblings. As the first to be swallowed she was also the last to be disgorged, and so was named as both the eldest and youngest of the six Kronides. There were only twelve thrones on Olympus, so when Dionysus was incorporated into the pantheon, there was no seat for him. Hestia graciously rose and sat beside the hearth, where she is happiest, giving her throne to Dionysus. Hestia is venerated beside the hearth, stove, or other major source of fire. The hearth in each home was the central place around which family members gathered. When a family member left their home to begin a new family, a parcel of fire was taken from the family home to begin the new home fire--symbolizing the continuity of family through the perpetual flame. Hestia’s fire is never permitted to go out except in ritual. It must then be ritually re-lit. Offerings to Hestia may be respectfully placed directly into her flames. ICONOGRAPHY: A gracious, regal, modestly dressed mature woman wearing a veil.